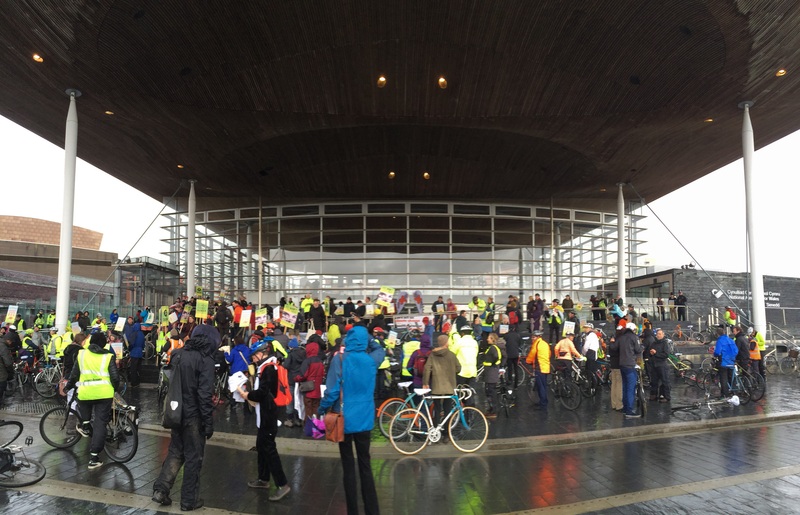 At 1.00pm on Tuesday people from across Wales will “cycle on the Senedd” to lobby Welsh Government for an increase in investment in walking and cycling to £20 per head, as recommended in a recent report by the Assembly’s Economy, Infrastructure and Skills Committee. Welsh Government is currently spending just £10 per head, half of the level in Scotland. They will hear from representatives of each of the major parties as well as speakers from health and environmental organisations. The lobby has the support of the British Heart Foundation, British Lung Foundation, Friends of the Earth Cymru, Oxfam Cymru, Sustrans Cymru, Welsh Cycling and WWF Cymru, as well as cycling organisations from across Wales.